Welcome to our UK STSL FAQs. Should you not find the answer you need, please do not hesitate to contact us. The Single Title Screening Licence (STSL) is one of the licence options available on a per film title per screening basis. How do I open an STSL account? To apply for an STSL account, follow our 5-step guide here. What is the £150 security deposit for and when do I get this back? This is a holding fee to activate your STSL account and is fully refundable upon account closure (subject to all rental films returned and invoices paid). Can I use my £150 deposit towards my licence fee? The deposit and licence fee are kept completely separate from each other, as your deposit is fully refunded when the account is closed. However, should you wish to discuss applying your deposit to outstanding invoices, please contact us at CreditControl@filmbankmedia.com. Do I need a different account for indoor and outdoor screenings? No, you only need one STSL account for both indoor and outdoor screenings. However, please note that the booking process differs from outdoor to indoor screenings. Please refer to the Outdoor section below. Can I edit my existing booking online? Yes. You can do this by logging into your online account and select ‘Edit Bookings/Enter Returns’ button. Select the ‘pencil’ icon and make your amendments. For all amendments relating to past screenings or reducing the number of screenings, please contact us at info@filmbankmedia.com as soon as possible. How do I change my contact details online? Once you have logged in, please select ‘Amend Contact Details’ which can be located on the right hand side. Should you wish to change your organisation name or login email address, please email creditcontrol@filmbankmedia.com. Do I need a licence for my film screenings, even if I’m not charging? Yes, you will still require a licence. Any screening taking place outside of the home or cinema requires a licence under UK copyright law. In this instance, your licence will be granted under one of our non-commercial (free-of-charge to view) terms instead of commercial (charged ticket admission). For more information regarding licence options, click here. Once I have placed a booking how do I know it has been approved? Please allow one working day for your booking to be approved. To check your booking status, select 'Edit Booking/Enter Returns'. Should your status say 'Approved', you are fine to proceed with your screening. If your status has not changed to 'Approved' after one working day, please contact info@filmbankmedia.com. How much does the licence cost for indoor screenings? Please view our indoor price list here. I have requested a DVD/Blu-ray to be sent out; when will I receive this copy? All copies sent out by Filmbankmedia will arrive within 2-3 working days before your screening date. Why won't my DVD play in my laptop? Please note that pre-release copies must be played through a standard DVD player and will not work through a laptop or computer for security reasons. You can select ‘use own copy’ when placing your booking online, which permits you to source and screen your own DVD or Blu-ray from a legitimate retail outlet. Alternatively if you select ‘DVD’ or ‘Blu-Ray’ then a copy will be sent out to you (subject to availability). Please note an additional delivery fee of £14+VAT will apply for each copy sent out. How do I know which films are available to book through Filmbankmedia? You can view our extensive film catalogue of over 13,000 titles from classics to latest releases here. What do I do if I see a title in your film catalogue but it’s not showing when I request a new booking? It is advised to search a title without prefixes such as 'the' or 'a'. For example ‘The Greatest Showman’ should be searched under ‘Greatest Showman, The’ etc. If you still cannot find the title you are looking for, please email info@filmbankmedia.com with the title and year and we will look into this for you. When can I start advertising my screening? You can advertise your screening once your booking has been approved and the appropriate licence is in place. Please see our advertising guidelines for reference as well as information about Image Bank. If you wish to cancel your screening, please notify us in writing at least 24 hours prior to the screening date. If you cancel within 24 hrs or after the screening date, the full licence fee will apply. How do I submit my box office returns after the screening? Once you have logged into your online account, please select ‘Edit Booking/Enter Returns’. Then select the ‘£’ symbol and confirm your number of screenings. Then submit your box office figures; ticket price against how many tickets sold. This will immediately generate an invoice, which can then be located under your ‘current invoices’ tab through the online system. How do I close my account and obtain my deposit refund? Please complete the closure of account form within the following link and submit this through the website. We will then aim to review and refund your full deposit within 1-2 weeks. How do I request a licence for an outdoor screening? Complete our Screening Application Form and return it to outdoor@filmbankmedia.com for review. We will then notify you of the approved status. 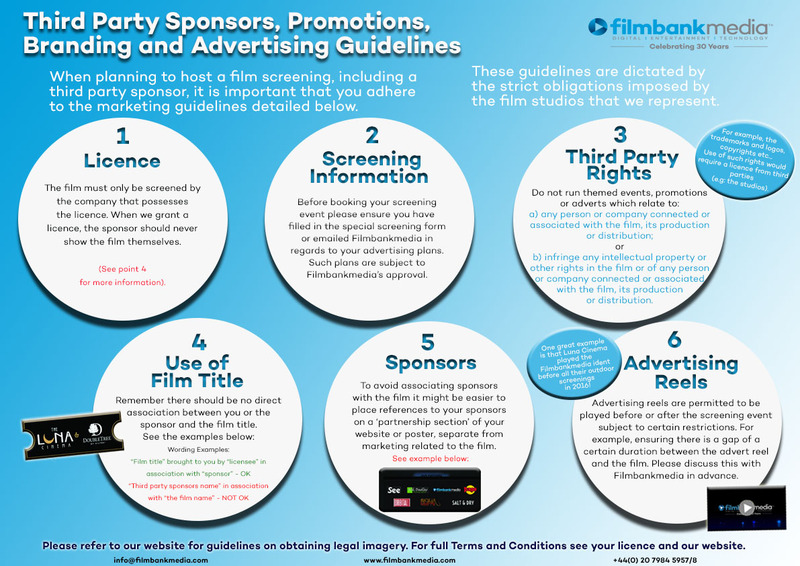 Please note you cannot apply for an outdoor screening licence through the Filmbankmedia online system. What is the timeline for the outdoor screening application process? Once we have received your screening application form, please allow between 5-10 working days for the approval process. How much does it cost for an outdoor screening licence? Outdoor screenings fall under special pricing terms with prices starting from a flat rate fee or minimum guarantee of £139+VAT per film, per screening. Under commercial terms the percentage will start from 40% of your box office takings. Please note the confirmed licence fee is subject to review of your completed submission and will be confirmed once approval is granted.